An award-winning, beautiful picture book—poetry and art exploring issues of African American identity. A favorite book to share in schools and homes. Included in Brightly.com's 2017 list of recommended diverse poetry picture books for kids, and a Coretta Scott King Honor Book. "A must," according to Kirkus. "Delicately interwoven images. Laden with meaning, the poetry is significant and lovely. Cooper's paintings, with vibrant, unsentimentalized characters in earth tone illumined with gold, are warm, contemplative." Booklist commented: "Poems rooted in home, family, and the African-American experience. Highly readable and attractive." Added Brightly.com: "Each poem has a unique message and theme and is accompanied by beautiful brown and gold earth-tone illustrations related to broomwheat tea." 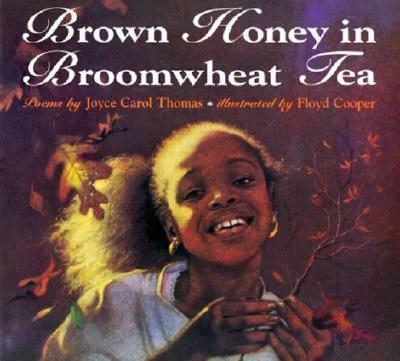 Joyce Carol Thomas is an internationally renowned author who received the National Book Award for her first novel, Marked By Fire, and a Coretta Scott King Honor for The Blacker the Berry and for her first picture book, Brown Honey in Broomwheat Tea. Her picture book I Have Heard of a Land received a Coretta Scott King Honor and an IRA/CBC Teachers' Choice Award and was an ALA Notable Book. Her other titles include The Gospel Cinderella, Crowning Glory, Gingerbread Days, and A Gathering of Flowers. Ms. Thomas lives in Berkeley, California.